Best DJI Drones 2019 – reviews of the top dji drones for sale in 2019. Find out which DJI Brand drones are best. Featuring Mavic PRO, Phantom 3 & 4, Inspire and more. The DJI Mavic Air is a small device with massive ambitions. It is basically a consumer drone that demonstrates how committed DJI is to innovation. A three-axis gimbal, 4K video recording, onboard storage and an improved obstacle avoidance system are packed into a foldable and compact form factor that can be easily slipped into a jacket pocket. 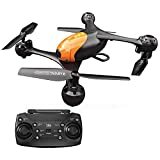 You would be hard pressed to find a more superior drone that so neatly packs up and has as many innovative features as this one. This near-perfect device is the love child of the extremely successful Mavic Pro and the user-friendly and compact Spark. 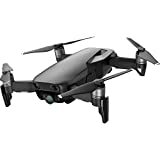 The foldable rotor arms and top-class technology was taken from the Mavic Pro and craftily combined with the playfulness and small form factor of the Spark; after which, DJI improved on both, producing its best drone thus far for consumers. 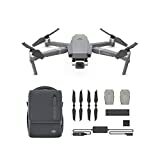 For approximately $800, you will be able to purchase the DJI Mavic Air and accessories. For roughly $1000, you will get the drone, its accessories and the Fly More Combo. This is the most powerful consumer drone you can purchase and this is because of its gimbal-stabilized Hasselblad camera. The camera has a 1-inch CMOS sensor that produces spectacular aerial pictures and 4K videos. The pictures are more detailed, brighter and strikingly superior to those captured with the previous model. Improvements have also been made to the software. There are new modes for capturing videos and pictures. This includes a built-in hyperlapse mode, which produces amazing aerial videos. However, this comes at an additional cost – the drone is more expensive than the earlier version. Depending on the package you decide to buy on Amazon, the cost will range between roughly $1300 and $1900. The DJI Spark has different colored body shells and exceptional gesture controls that give you a feeling of being a Jedi. It is controlled easily through your smartphone; however, it is worth mentioning that your phone will be the only controller you will have, unless you choose to buy a separate controller. The Spark is incredibly light, which is not surprising since it is the size of a can. Its size is both one of its greatest weaknesses and one of its greatest strengths. Because of its size, it will be impacted by wind during flight but it is quite easy to transport in your bag. Despite its size, the device is packed full of technology; these include GPS, obstacle detection and stabilization. It has a 2-axis stabilized gimbal camera, subject tracking from various angles, FlightAutonomy with obstacle detection and decent speed. 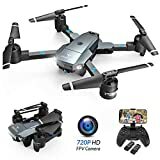 The cost of the DJI Spark on Amazon ranges between approximately $350 and $400. For an additional $108, you can be the proud owner of the DJI Spark Remote Controller. The DJI Phantom 4 is a tweaking of the already remarkable DJI Phantom 3 Professional. The refinement comes with sturdier construction, updated object-avoidance technology and an exceptional dedicated remote control that connects to an awesome feature-rich smartphone app. This makes it a valuable upgrade over the Phantom 3 and an even more superior option for photographers in need of a sturdy kit that delivers remarkable results. The Phantom 4 supports 4K video recording and its gimbal design is an indication that you will get tremendously steady footage even when the device is changing direction and moving at high speed. However, there is a big downer as its battery life only lasts between 15 and 20 minutes, based on how hard the drone is pushed. The drone is powered by a single battery located in the back. There is a set of lights on the battery that indicates the amount of charge remaining. This provides a convenient visual guide to flight duration. It is a more suitable option for budding aerial photographers as opposed to more seasoned professionals. The cost of the DJI Phantom 4 on Amazon ranges between approximately $750 and $950. The Mavic Pro is the smartest, smallest and most approachable DJI drone yet. The drone has the capacity to fold up into a package about the size of a water bottle. Unusual for devices of this size, the camera is attached to a gimbal. The drone delivers remarkable results with both videos and photos in good lighting. However, the small size of the sensor that indicates low-light shooting can be problematic sometimes. This drone has a top speed of approximately 40 miles per hour: therefore, it is not slouchy in that department. Additionally, the battery lasts between approximately 20 and 25 minutes of flight action. The Mavic Pro has a dedicated controller that uses the display of your phone to highlight precisely what the drone is seeing. The range has been quoted as being more than 4 miles. This provides the opportunity to capture spectacular videos and stills without having to worry about dropping connection. The cost of the DJI Mavic Pro on Amazon is approximately $685. The highly-impressive DJI Inspire 2 has soundly knocked its predecessor out of the top position. This drone is much more attractive with its upgrade of sleek metal composite bodywork. In addition, the object avoidance technology is more advanced so you do not have to be concerned about that gorgeous body getting scratched by accidentally hitting a wall. The twin-battery arrangement delivers over 25 minutes of flight time. The Inspire 2 also has the capacity to swap camera lenses; therefore, professional videographers and photographers will have total control over their 5K video and images. The smartphone app is loaded with impressive features and the dedicated controller makes it remarkably easy to control this drone incredibly easy to control. The cost of the DJI Inspire 2 on Amazon is approximately $3000. Although it may resemble a fearsome war-robot from the distant future, the DJI Inspire 1 will capture your heart with its agility and impressive features after you get over its fairly intimidating appearance. It is among the most capable and powerful drones money can buy. 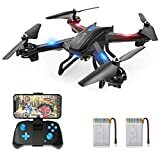 The drone offers a robust build, an amazing amount of control and the capacity to upgrade certain components such as the battery, camera and propellers. It has its own dedicated controller, which boasts remarkable range and its camera is mounted on a gimbal to provide perfect aim. It is upgradeable; therefore, there is no need to be concerned about your valuable investment becoming outdated after only a few months. The performance of Inspire 1 in the air is undoubtedly remarkable, even if the weather conditions are quite windy. In addition, the DJI Inspire 1 is tremendously swift and when it is combined with its impressive controller, it is very easy to maneuver. The only shortcomings that have been discovered are its price and the fact that you will only get approximately 15 to 20 minutes of flight duration form the bundled battery before the drone will have to be recharged. 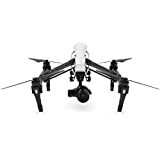 The cost of the DJI Inspire 1 on Amazon ranges between approximately $3000 and $3250. DJI is currently renowned for being the world leading manufacturer of civilian drones and aerial imaging technology. In 2017, the company’s revenue was $2.83 billion; this represents an 80 percent increase of its 2016 revenue. Frank Wang is the founder and CEO but he originally went by Wāng Tāo. In 2006, DJI was started in a dorm room while Wang pursued his studies at Hong Kung University of Science and Technology. Forbes has recently estimated the net worth of Wang at $3.2 billion and this figure is still growing. At first, DJI meant Dà-Jiāng Sciences; however, it ultimately became Dà-Jiāng Innovation. Based in Shenzen, China, DJI has stated that 80 percent of its products are sold overseas. In August of 2017, the company received an Emmy Award from the National Academy of Television Arts & Sciences in the category of Technology and Engineering. The products manufactured by DJI have drastically changed how television shows are recorded. Cinematographers and directors have been using DJI drones to propel aerial imaging into a whole new stratosphere. The evidence of this can be seen in productions such as American Ninja Warrior, The Amazing Race, Game of Thrones, Better Call Saul and many more. Picking the best DJI drone for your budget and needs can be quite a daunting task. If you are choosing between the Phantom 4 Pro, Inspire 1, Inspire 2, Spark, Mavic Pro, Mavic Pro Air and Mavic 2 Pro or any of the other models, there are a number of different factors to consider. These include battery capacity, photo resolutions, service ceiling, breaking speed, transmitter power and operating frequency. By doing your research and looking at the features and costs of the drones highlighted above, you can decide on which drone will ultimately best suit your budget and preference. In the consumer market, Yuneec is major competition for DJI. DJI Phantom line directly competes with Yuneec Typhoon series, which actually offers certain features not provided in the Phantoms. These include a freely rotating camera mounted on the Typhoon H and Typhoon H Plus. Yuneec also has smaller models like the Mantis and Breeze to appeal to flyers who desire a more casual, user-friendly drone experience. Priced at roughly $3000, DJI Inspire 2 is meant for professional news organizations, cinematographers and independent filmmakers; this cost does not include a camera. There is the option of adding a Super 35mm cinema mount camera, a one-inch sensor fixed-lens, a Micro Four Thirds interchangeable lens camera and it has support to capture 6K videos. Yuneec Tornado H920 has a Micro Four Thirds camera as well. It is a huge with 6 rotors and space to accommodate 3 batteries, giving it an impressive flight capacity of 42 minutes. It has a CGO4 camera and unlike the Inspire 2, does not record uncompressed videos. Both models are impressive.